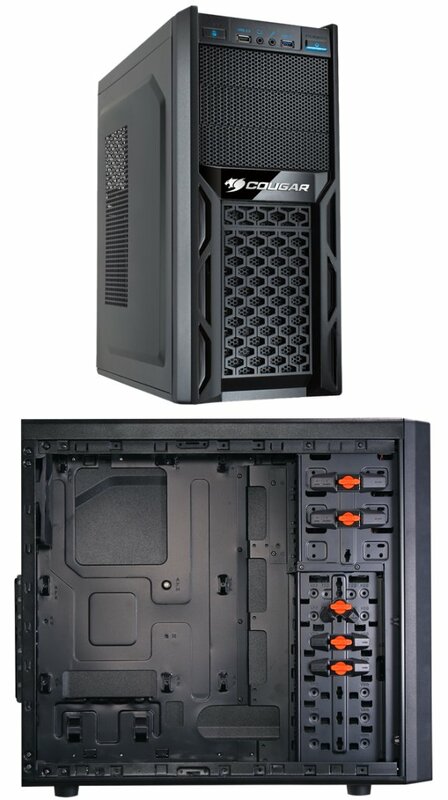 Cougar reveals Solution, a new mid-tower gaming case with a rugged appearance, all-black coating, optimized ventilation, a PSU air filter and cable routing features. COUGAR today announced global availability of their latest middle tower PC case focusing on attractive design and convenient every-day usage features at an affordable budget price point. The COUGAR Solution comes entirely black coated outside and inside, the honey-comb and mesh hybrid intake design creates a solid, rugged look with optimized ventilation characteristics. As COUGAR is specifically targeting demanding enthusiast users and gamers, powerful high-end setups are always a major focus of attention when designing PC cases, power supplies or cooling fan solutions. Therefore, the COUGAR Solution offers a broad range of ventilation upgrade potential with up to 8 installable fans. But ventilation is more than just about fans. In order to optimize internal airflow, the COUGAR Solution has been created with a sophisticated, yet easy to use cable-routing in mind. The cable routing does not only ensure a clean inside of your system, but moreover allows your components to stay cool. In turn this also ensures a longer product life span. But cooling and ventilation goes even further. The backside PCIe slots are all vented and two holes for water-cooling hoses are provided for as well. So if you are in the game for advanced gameplay and need to install multiple VGA setups, you are cool and safe with up to 320 mm of space for your graphics cards. And the extra large cutout on the motherboard backplate provides most convenient access for CPU cooler installation, so you can swap coolers on-the-fly. As a power supply specialist, COUGAR understands best where and how to place your PSU. In the COUGAR Solution case, the power supply unit is placed on the bottom, so all motherboard, components and storage devices can be reached easily. This placement also ensures that your power supply is located at the coolest spot or your PC case, since cold air stays at the bottom, while hot air floats upwards. On top of things, the COUGAR Solution case provides for an air filter underneath the power supply, so your PSU fan stays clean and powerful. Cumbersome installation of optical drives and HDDs are a matter of the past, as screwless-installation mechanisms make it child’s play to install, replace or upgrade them within the COUGAR Solution case. 5.25” and 3.5” drives are easily handled with a simple click. Even a 2.5” drive can be easily installed right at the bottom of the case underneath the drive-cage. More info about the Solution's features and specifications can be found at Cougar.